If you thought there was nothing scary about yoga, think again! Yoga is a band that's been called a Black Metal version of Throbbing Gristle. The heavy, nightmarish acid-flashback sound of its debut album Megafauna is out just in time for Halloween. The disc is released on the intrepid tastemaker label, Holy Mountain (Wooden Shjips, OM, Six Organs of Admittance), offering these sample tracks: "Seventh Mind" (HERE), "Encante" (HERE) and "Fourth Eye" (HERE). Understand this: Yoga dispenses a sinister frailty of howling swells in hissing static that combusts into crawling shock heaps, to the effect of Mayhem performing Twin Peaks incidentals in a prairie recorded by The KLF. 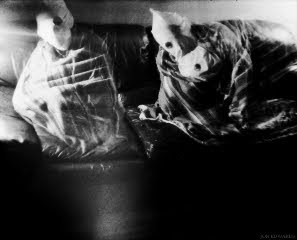 A brief description casts them as black metal’s answer to Throbbing Gristle. The texture-based rendering of their compositions sails them on a strange sea between song and sound effect as it bobs along the waves like a dead man’s bottled message. Aspects of Goblin rehearsals in dead hills is interrupted as Monster Zero carves mountain sides with lightning breath. Oscillating leads pummel into churning riffs as if “Caledonia” was performed in an echo chamber near Lodi, New Jersey. The extrinsic properties of this work may result in disambiguation. “The sound of Yoga takes the lo-fi practice space recordings of grimmest of the black metal outfits and combines it with the murky, muddy, noise-drenched blur of bands like Wold... even further, rendering their sound so muted and lo-fidelity that even when they’re blasting furiously, it still sounds like a busted music box or an old black metal 78. And then there’s the fact that Yoga spends a good amount of their time not blasting blackly, but instead, crafting synth-heavy Goblin-style film music, all throbbing bass and buzzing synths, creepy minor key melodies, and tons of haunting ambience. Those songs too are wreathed in a foggy night-on-the-moors sort of murk that ties those closely to the more blackened ones. For more information, please contact Dave Clifford at dave@usthemgroup.com. 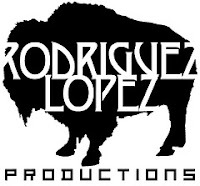 Renown guitarist and musical mastermind Omar Rodriguez Lopez is set to release perhaps his most melodic and revealing album to date worldwide on November 10th, 2009 via his own Rodriguez Lopez Productions, with European release on September 28th. The disc, titled Xenophanes is the first to feature lead vocals from the Grammy-winning guitar legend -- and we don't use the word "legend" lightly, Rolling Stone hails him among their "Greatest Guitarists of All Time", placing him on that issue's cover. Check out the first MP3, "Mundo De Ciegos" (HERE). Wikipedia tells us that Xenophanes was a Greek philosopher, poet, and social and religious critic of the 5th century BC. His pantheistic conception of the Universe supposed that everything in existence has always existed. He rejected his contemporaries' notions of an anthropomorphic "god" (or hierarchy of gods) in favor of a concept not the least bit irrelevant to our 21st century mindset, that of a singular (and hence, all-encompassing) global consciousness. His unorthodox concepts were not widely acknowledged until many hundreds of years after his death, and suffice to say, their material concerns are primarily those which humans wage war over two-and-a-half millennia later. Little surprise, then, that this iconoclastic anomaly of a man should lend his name to a new concept album by The Mars Volta's hyper-prolific mastermind, Omar Rodriguez Lopez. The inaugural recording from Rodriguez Lopez's low-profile compound in Zapopan, Mexico, Xenophanes is the first album which finds him at the helm vocally and lyrically, as well as musically. Sung entirely in Spanish, Xenophanes showcases a side of Omar rarely seen before, allowing for a much more gestural experience of the man rather than simply the musician, and truly distinguishing this album from its myriad predecessors. 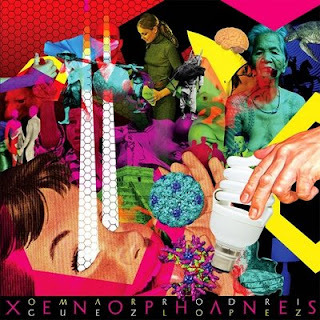 Equal parts Volta bombast, El Grupo Nuevo... technicality, and a textural richness unequaled on prior solo releases, Xenophanes is a triumph of imagination and an inspired, concise statement. A conceptual journey through life, death, and re-birth, the album tells the story of a selfish and judgmental female caseworker who falls in love with a male client, only for him to die soon thereafter. Over the course of eleven subsequent lifetimes, the woman experiences life from every conceivable vantage point as her soul evolves, thereby allowing the maturity and eventual letting-go of her ego which in turn enables the realization that the man was, and always has been, her father spirit. 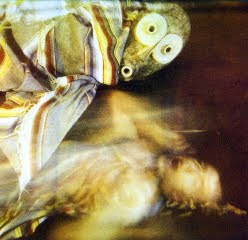 Suggesting the fractal and holographic nature of both consciousness and physical reality, the concepts embraced on Xenophanes will appear at least vaguely familiar to anyone with experience in the psychedelic and/or shamanic realms; concepts which Xenophanes himself was likely the first to express within the confines of Western philosophy. In order to execute the unpredictable, emotionally-charged compositions on Xenophanes, Rodriguez Lopez once again enlists his veteran co-conspirators: bassist Juan Alderete de la Peña, drummer Thomas Pridgen and keyboardist/percussionist Marcel Rodriguez Lopez. Additionally, the album includes contributions from Mark Aanderud (additional keyboards), as well as the notable voice of Ximena Sariñana, doubling and backing Rodriguez Lopez's vocals. As Sariñana's presence on Omar's recordings and during live performances has already been a cause for much speculation, it should be made clear that Xenophanes does not feature the accomplished and versatile singer's own vocal compostions. 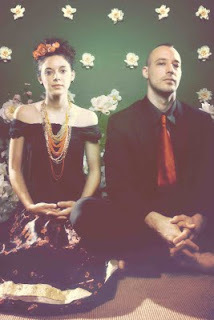 Subsequent releases (the forthcoming Los Suenos De Un Hidago and Ciencia De Los Inutiles albums, for instance) will fully showcase Sariñana's penchant for infectious melody and engaging lyrics. Chan "Cat Power" Marshall fronting Queens of the Stone Age? Karen O leading Death From Above 1979? Cleveland duo mr. Gnome has been given many unusual comparisons, all of which seem to indicate the band's spectacularly unique sound. And, while none seem to fully capture the band's loftily heavy-beautiful music, mr. Gnome offers up two brand new tracks from its forthcoming album recorded at Josh Homme's Pink Duck Studios in Los Angeles. Follow the links to MP3s for "Slow Side" (CLICK HERE) and "Vampires" (CLICK HERE). The endlessly touring pair of guitarist/vocalist Nicole Barile and drummer/vocalist Sam Meister is currently mixing at Butch Vig's Smart Studios in Madison, WI putting the finishing touches on its sophomore album, Heave Yer Skeleton, slated for release in November. Leading up to the album's release, mr. Gnome will take to the road throughout October and November. Please see complete tour dates below. The psychedelically syncopated sounds of Cleveland's mr. Gnome draw on a visceral mix of contrasting textures. Masculine and feminine, soft whispers and shrill yelps, pounding drums and soothing lullabies combine to form a discursive indie-rock collage. The duo's jagged symphony of sound has them compared to a scattershot of artists ranging from Portishead, Cat Power, Massive Attack, and Joanna Newsom, to Death From Above 1979, Blonde Redhead, Sonic Youth, and Yeah Yeah Yeahs. Heave Yer Skeleton, the follow-up to mr. Gnome's debut full-length, Deliver This Creature, (now available on vinyl HERE) promises to be no less a musical twist than the last offering. Returning with the same basic, minimalist ingredients; a soulful, feminine power and inventive, dynamic drumming, the two are suspended in a sea of drug-induced themes pouring from their simplistic set-up. The id, dreams, silver giants, hallucinations, flying horses, the devil, Armageddon, vampires, and ghosts are just a few of the hauntingly, hypnotic subjects floating between pleasure and pain in the soundscapes of Heave Yer Skeleton. In April 2009 the duo received an invitation to record at Josh Homme's (Queens of the Stone Age) Pink Duck Studios located in Los Angeles. Studio manager and engineer Justin Smith (QOTSA, Eagles of Death Metal, Arctic Monkeys, Spinnerette) recorded the sessions and the location served as the perfect creative environment for mr. Gnome's sophomore effort. After returning to Cleveland, the album received last minute touches and additional tracking at Ante Up Audio with Adam Korbesmeyer. The album was mixed at Butch Vig’s Smart Studios in Madison, Wisconsin by Beau Sorenson (Death Cab For Cutie, Sparklehorse, The Secret Machines, Garbage, Tegan and Sara). Extending and experimenting on elements only touched on in their first full-length, mr. Gnome’s Heave Yer Skeleton is scheduled for a November 2009 release.